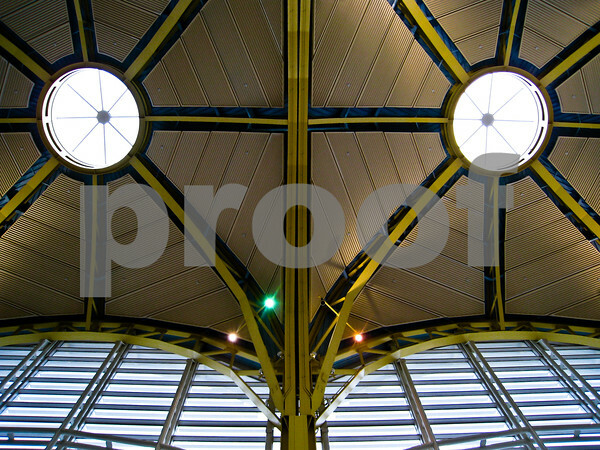 So there I was in Washington’s National Airport, sitting/lying on the marble floor smack dab in the middle of the main terminal concourse shooting straight up at the domed ceiling when I was approached by members of the airport’s security force quite concerned with what I was doing. I explained my photo blog and that on this particular day, I was intrigued by the fact that the skylights on the ceiling looked like the eyes of a praying mantis and the girders; the framing of the rest of the creature’s triangular face. I am assuming that they thought I was insane but determined that I didn’t pose a security risk, so after ten minutes of questioning I was allowed to leave. Am I crazy or do you see it too? Interesting story. Since 911, taking pictures in public places can get a little sticky sometimes. It sounds like the security was doing their job without overstepping their bounds as saying that you couldn't take pictures. You are crazy, and yes I see it too! I've been missing the posts, glad you're back!